Beware of the French Baguette! 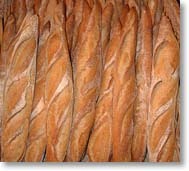 A baguette is a thin and crusty long loaf, so named from the word that means "wand". In truth, the bread is somewhat like a magical wand, replete with charming images and myths. A good baguette is the result of a perfect balance between the crust and a soft interior, the mie. Though originating from Paris, baguettes can be found everywhere in France, and now (theoretically) anywhere in the world, as the demand has grown to a fever pitch. People throughout the world dream of the baguette. Waitresses of popular restaurants in the Quartier Latin contemplate with a proud smile a group of Japanese tourists asking for their "bread basket" to be refilled. As they bring another helping, perhaps one of them will whisper to a French customer nearby, "They eat it like cakes!" Or perhaps it is the mythological image of a clochard (Parisian homeless person) lying along the Seine, contentedly partaking of a piece of bread with camembert and red wine, which inspires hundreds of tourists to park themselves on the benches of public gardens  obviously blissful as they bite, chew and swallow their picnic meal. If their moveable feast is perchance also blessed with a beam of sunshine, they have already found their way into Heaven: Springtime in Paris! The image of the baguette as a symbol of Paris has even been popularized in the movies: in Everybody Says I Love You, we watched Woody Allen, this pure product of American culture so enamored with that of the Old World, walking  just like a "real Parisian"  on a bridge, his baguette unsanitarily held under his arm. You won't find a good baguette here easily (although one made by Alberto  sold at Fairway on Broadway  is excellent). What makes the technical difference? At Kayser's, opened five years ago on rue Monge in Paris, Baker Damien will tell you: "First, the flour is severely controlled, coming from a very specific part of France (Gâtinais, south of Paris) where crops are grown without pesticides, then carefully processed by the miller, without any additive. Second, a slow rising is necessary, which means a good process. Many bakers may use only yeast, but Eric Kayser gave up yeast. Instead, he makes all his bread and viennoiseries from natural liquid leaven, so that the acidity is lower than when using leaven from recycled dough. Third, since 'a baguette has only four hours to live', you have to bake it en continu (on a continuous basis) during the night for the morning customers, in the morning for the daytime customers. There is no freezing or quick-processing for high quality bread, 'just love and time'." To that I would counter that even a piece of stale bread tastes great at Kayser! As a reply, Damien merely smiles and says nothing: the line of 10 to 15 people waiting patiently is a better answer, as well as the other shops which have propagated from this place, selling his baguettes as far away as Miami (FL), Japan, and Israel. Besides Kayser, many other bakers in Paris make wonderful, tasty baguettes. Patricia Wells is an avid explorer, and her guide is quite useful. One way to gauge the quality of a boulangerie? Just check out the line of customers, and also the cashier's face: deeply satisfied that she is giving the customer something unique pour son argent. So then, what could be the trouble with the French baguette? Everyone likes it! The more you like it, the more you will eat. Truth be said, you will love it. So many charming American ladies soon become like a Renoir, which is still attractive (even if not fashionable in these times of slim figures), then like a Rubens, which is slightly less attractive. The final testament comes when they board the plane back to the U.S., and might have to pay an extra fare for themselves  so good is the bread! Copyright © 2002 Marguerite Czarnecki  All Rights Reserved. Reproduced with permission of the author. Marguerite Czarnecki is a recently retired teacher of French language and literature at a public lycée near Paris. She has graciously furnished this article for the enjoyment of our visitors. We invite your feedback, and your encouragement to Marguerite to continue writing about her perspectives on Paris! Image sources: Photos of the Kayser bakery kindly provided by Silvan Fabrice. Copyright 2002 - All Rights Reserved. In a handy guide to the best culinary spots around town, Epicurious opines, "Maison Kayser is good at so many things, from natural-starter levains to delicate croissants. And the lines are so long. So it seems somehow unfair that Kayser also has the best baguettes in Paris. But it does: thick, crunchy, almost-burnt crusts giving way to moist, airy, chewy interiors with the tangy richness of fresh milk. When a baguette is this good, butter is strictly an afterthought." "If you're at Place Maubert Mutualité, perhaps browsing the Provençal goods at the thrice-weekly street market, go around the corner to the boulangerie E.K. Maison Kayser (8, rue Monge) for a variety of sandwiches on several kinds of bread," writes Deborah Baldwin in her article for France Today (and the Washington Post), in which she explores some methods for eating well without breaking the bank in Paris. "Maison Kayser is the local rage," according to Melinda Bergman Burgener, who has written a series of articles for Chez Vous on les ballades (leisurely strolls) through the neighborhoods of Paris. Check out her other articles on the Islands (of the Seine), St.-Germain, the Marais, Place des Vosges, and Luxembourg Gardens. In an article about this delicate pastry which originates from Italy, DiscoverParis.net writes, "At the acclaimed Maison Kayser of the 5th arrondissement, the dense cream filling of their chocolate macaron is made with dark chocolate." Patricia Barry, a French teacher at Saint Joseph's College in Brisbane (Queensland), Australia, has assembled this useful page containing images and useful vocabulary for ordering, eating, and describing every sort of French pastry. Une tarte vraiment pas tarte! Marion Dupuis, writing for Zurban.com, says this of their pear and caramel tart: "Il paraît que c'est un classique de la Maison Kayser en hiver. Alors dans la famille tartes sucrées, nous ne saurions trop vous recommander celle aux poires et au caramel ... parce qu'elle est simplement à tomber et qu'elle est plutôt légère. Délicieux!" A gastronomic tour of some of Paris' finest pastry shops and bakeries. Features dozens of recipes for such treats as Almond Croissants and Caramel Mousse Cake, along with food lore, histories of each shop, and more. 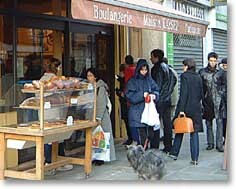 Features 223 bakeries representing all 20 arrondissements of Paris, with directions on how to reach them on the Métro. Most bakeries have tempting choices of take-out food, suggesting a picnic in a park close-by, to enjoy a true Parisian lunch. There's a touch of history in this book too, as the boulangers themselves have noted points of interest in their neighborhood. A guide to the over 80 food markets of Paris. Over 400 vivid photographs illustrate the colors and sights, while a fresh and personal narrative captures the unique atmosphere of each and every market, punctuated with historical tidbits and charming anecdotes. Practical maps and charts, addresses, and hidden places of interest.